Clarification: this “Christopher Robin” bears only a superficial resemblance to “Goodbye Christopher Robin” (2017) about the resentful, real-life son of A.A. Milne. Don’t confuse them. Years pass. He goes off to war, marries Evelyn (Hayley Atwell), gets a flat in London and has a lovely daughter, Madeline (Bronte Carmichael). That’s really a prologue. Now middle-aged Christopher Robin (Ewan McGregor) works as efficiency manager for a luggage company that’s losing money, so he’s forced to cancel an eagerly anticipated family weekend at their cottage in Sussex. The angst of disappointing Evelyn and Madeline precipitates an emotional crisis, as Pooh Bear squeezes through a hollow tree and magically appears in a London park, seeking Christopher Robin’s help in finding their animal friends who seem to have disappeared. Along the way, Christopher Robin re-discovers what’s really important in life and reconnects with his family. Utilizing A.A. Milne’s imaginative characters, it’s based on a story by Gregg Booker & Mark Steven Johnson and simplistically scripted by Alex Ross Perry, Tom McCarth and Allison Schroeder. Too bad they devote so much screen time to a pesky neighbor and the frantic car chase to the luggage company. After helming “Finding Neverland,” director Marc Foster has had plenty of experience combining real-life actors with CGI, shifting tones and adeptly utilizing the voices of Jim Cummings, Brad Garrett, Toby Jones, etc. FYI: British author A.A. Milne published his first Winnie the Pooh story on Dec. 24, 1925, in the London Evening News; the Hundred-Acre Wood was based on Ashdown Forest near his home in East Sussex, and the name Winnie referenced a famous bear in the London zoo. 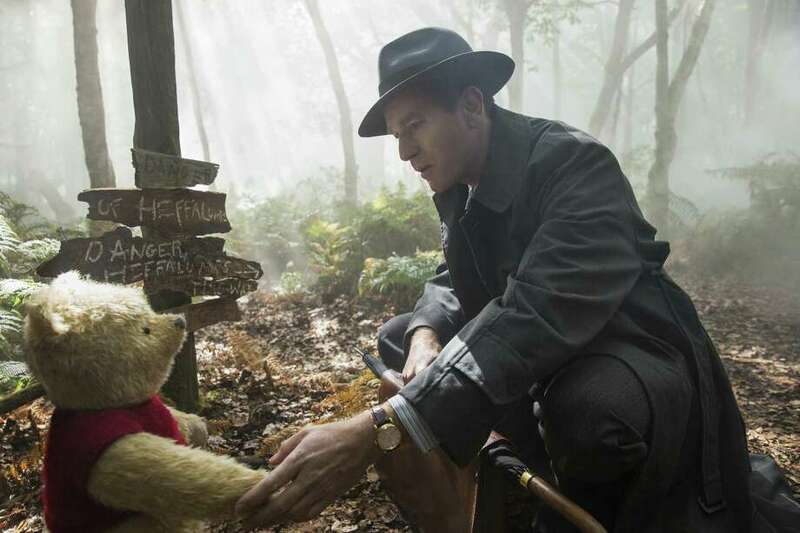 On the Granger Movie Gauge of 1 to 10, “Christopher Robin” is a sweet, sentimental 7, a low-key, feel-good family film.